Since the announcement of the construction of Be Our Guest restaurant hit the internet, I have been daydreaming of what it would be like to physically step into my favorite scene in my favorite Disney movie of all time. So naturally I could not resist asking my dear husband oh-so-nicely if he wouldn’t mind holding down the fort at home while I snuck away with some of my favorite ladies to attend the official opening night. I was lucky enough to experience a dress rehearsal of New Fantasyland in October, and this dinner was going to be the icing on the cupcake of all things New Fantasyland. So now, I invite you to relax, let us pull up a chair, as Agent Heather proudly presents.....this Be Our Guest dinner review! AMAZING. That’s really all I even need to say. Ah. Maze. Ing. I think one of the many things so well done about Be Our Guest is the check-in station that sits at the beginning of the bridge, encased in stone. It keeps the waiting crowds away from the entrance, but it also enhances your entry experience once you are called in. After we checked-in, we received our pager and waited just a few moments before being buzzed and asked to proceed down the gargoyle lined bridge - in the dark with the lanterns along the bridge and the Beast’s Castle glowing off in the distance. You could say we skipped along we were so excited! The “golion” (cross of a goat and lion) statues flank the large wooden entry doors, which are topped by a beautiful stained glass piece featuring, of course, the magical rose. The foyer boasts beautiful stone and woodwork, more statues and gargoyles, deep rich fabrics, and a stunning mosaic of Belle dancing with Beast. I was thrilled that we were seated in the ballroom - it’s my personal favorite of the three dining areas. Our sweet server greeted us promptly with extensive knowledge of the menu offerings and so much excitement to share it all. She even taught us how to fold the rose napkins that were at the tables! First up were baskets of fresh French bread and butter dusted with sea salt (which were greatly enjoyed by my buddies, while I enjoyed honestly the best warmed gluten free rolls I’ve had yet on all Disney property). And yes, while we nibbled on our bread, we did so while sipping on fine French wines. I opted to take our servers suggestion of the Helfrich Pinot Gris from Alsace (which happens to be one of my favorite regions of France), and it was delightfully refreshing. None of us were disappointed with our toasting choices! For our appetizers, we shared the Garden Salad with champagne vinaigrette, and the Seasonal Salad Trio (Roasted beet with gold raisins and oranges; Green beans with tomatoes and roasted shallots; Watermelon with radish and mint). The Garden Salad was simple yet fresh and not overly dressed. The Trio was more than enough to share with someone else; each sampling had a unique flavor profile and were all very light, but my favorite was the Roasted beet option for it’s subtle sweet and savory combination. Dinner arrived just as we finished our appetizers; we were very pleased how well the restaurant seemed to be operating on a full opening night crowd. Us four ladies got four different meals, and since I could not sample from each plate because of my allergy, I asked them to give a review on their dishes! Nancy, on the Sauteed Shrimp and Scallops: The shrimp and scallops were cooked perfectly and were nestled into a giant puff pastry decorated with a pleasing sauce. While there could have been more sauce to balance the dryness of the puff pastry, everything was cooked to perfection. Kelly, on the Layered Ratatouille: The layered ratatouille would delight a vegetarian however it managed to satisfy my carnivorous desires. This beautiful tiered plate included eggplant, zucchini, mushrooms, tomatoes and sweet caramelized onions on a bed of quinoa. I was expecting the quinoa to be slightly bland but the layers of flavorful oven baked vegetables and the red pepper sauce that this stacked goodness rested upon made it exciting. I would not hesitate to order this again. Alysse, on the Thyme-scented Pork Rack Chop: The kitchen was very accommodating and allowed me to substitute the saffron smashed potatoes for the au gratin pasta served with the thyme-scented pork rack chop. Both spices were easily recognizable, the saffron making the potatoes a standout and the thyme adding beautiful woodsy flavor to the nice piece of meat. Heather, on the Pan-Seared Salmon on Leek Fondue: The salmon was very fresh and cooked perfectly, with a light seasoning that did not overpower the dish. The potatoes and leeks paired very well together. Dessert arrived via the dessert cart - what a fun touch! The strawberry cupcake was deemed sweet but balanced by the cream cheese frosting, and the lemon meringue cupcake was moist and light. I was delighted to see that the lemon-raspberry cream puff was both gluten free and no-sugar added, and even more delighted that I did not feel cheated of either gluten or sugar at all. It was the first cream puff I have had in years and it did not disappoint - it reminded me of creme puffs of pre-allergy days, delicious! The only thing that did slightly disappoint was the dessert wine, La Fleur d’Or. I usually enjoy a dessert wine but this was entirely too sweet, so much so I could not drink much of it at all. My sister, Alysse, was celebrating her birthday a wee-bit early on this night. Our attentive server noted the celebration pin she had on and, at the end of our dessert course, came out with a very, very special plate - the plate I personally had been waiting for since the announcement of Be Our Guest. Yes, my friend, it was The Grey Stuff. With a birthday candle. I did know that I couldn’t enjoy the Grey Stuff as it does have gluten in it, but word is, it’s delicious. (I asked the dishes). 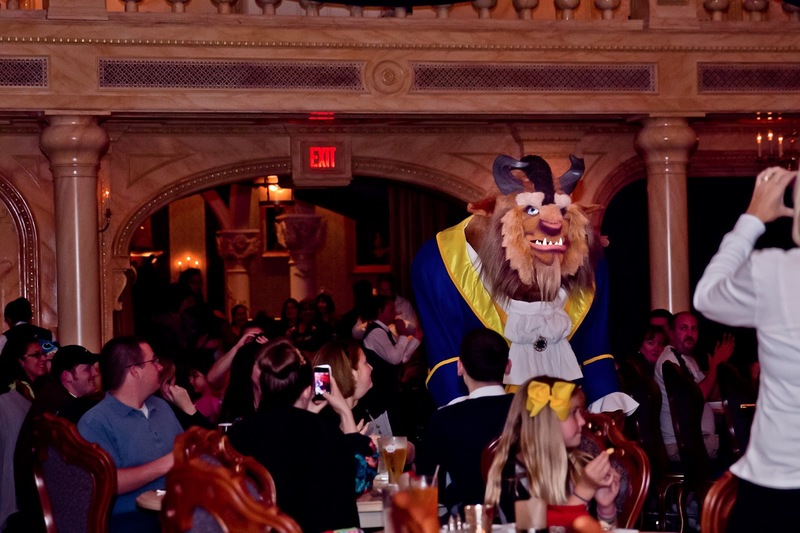 It is hard to choose a favorite part of the experience at Be Our Guest. I think on this night it was during the middle of our meal when music began to play, and the Master of the Castle was introduced - yes Beast himself took a stroll across the ballroom to greet his guests to a room full of cheers. Awe. Some. At the end of our meal, we took a peek into the other dining rooms. The West Wing (which, as Agent Richard also noted, is just due west of the ballroom) has an ominous feel with the dark walls, low light, and slashed tapestries, but the mood is lightened a bit by the hope you feel from the glowing and sparkling magical rose. The Rose Gallery is in complete contrast to the West Wing, as the 7-foot music box gives a cheerful feeling to the room lined in tapestries depicting happy scenes from Belle and Beast’s days together. There was one more bit of fun to be had before we had to leave - over in the drawing room, Beast was waiting (with some PhotoPass friends) to greet each of his guests for a photo. Perfect ending.